While the intent of this blog is to focus on Atlantic Canada, you’ll never see me pass up the opportunity to learn more about different beer scenes. I recently had the opportunity to meet with a couple of guys who are extremely knowledgeable about the Montreal (and broader Quebec) beer scene. Teklad Pavisian or Tico as he is known to all, is originally from Iran and has been living in Montreal since 1987. His stay in Montreal was expected to be a short one. He arrived that Winter with the intentions of making and saving a bit of money and eventually moving to Chicago where his uncle lived. When Summer came, and he saw what a great spot Montreal is at that time of year, there was no way he could leave. Tico is definitely an authority on beer and the specifically the Montreal beer scene. He is a brewer at Benelux, a long time home brewer and is Beer Judge Certification Program (BJCP) Certified although he is quick to point out he is not a “style Nazi”. Anthony Wilson or Jaf as he is more commonly known, is a native of Melbourne, Australia and has lived in Montreal for roughly the past five years and really developed his love of craft beer since moving here. Throughout our conversation it was very apparent that he has a thorough knowledge of the local scene including detailed knowledge of individual brews offered at different spots. The balance of this post is based on my discussion with the two of them. 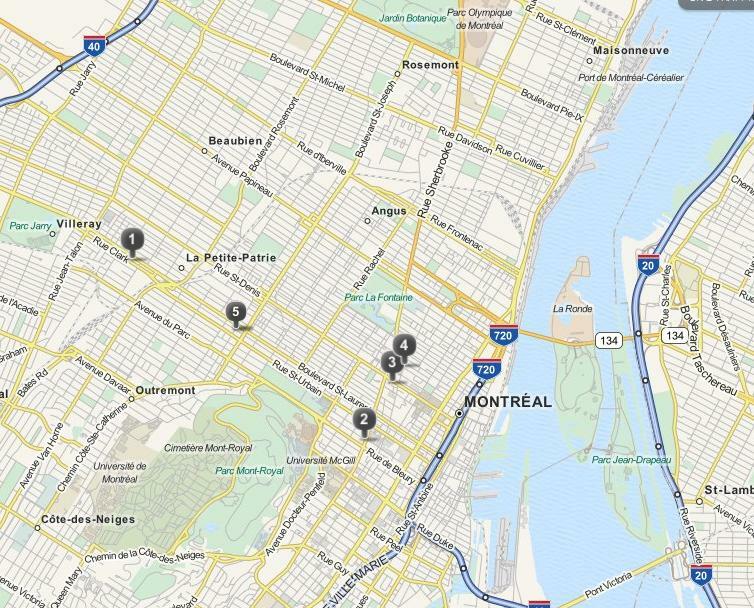 There are currently approximately 40 breweries in Quebec of various sizes with 25 permits pending for new brewpubs and microbreweries. When I asked Tico about collaboration between micros he indicated that there isn’t much formal collaboration resulting in official production but a great deal of knowledge sharing and “backstage” collaboration. There are a lot of friends within the industry and they tend to show respect by supporting special events and after parties put on by other brewpubs. Most brewpubs bring their own unique character and there is no fear of market saturation. He also definitely agrees with the idea of the craft beer industry being a brotherhood and that the more people discover great craft beer, the better it is for all. They way he described it craft brewers are looking to “enlighten” customers about the great brews that they offer. The Montreal craft beer scene is still relatively young with many of the players only being around the past 10 to 15 years and still developing their expertise. Jaf’s advice for anyone looking to try the best beer in the market was to stick to draught as many of the very small bottling micros are experiencing quality inconsistencies from batch to batch. As is commonly known, the Quebec beer scene is greatly influenced by Belgium tradition. This influence is driven primarily by language. Technical literature from Belgium is available in French, whereas information from most other parts of the world is most commonly available in English and to a lesser extent German. When I asked Tico and Jaf to list off the top 5 spots in Montreal for great beer they agreed on the list with the disclaimer that they were in no particular order. Vices et Versa (6631 St-Laurent) is not a brewpub but has the broadest range of Quebec craft beer with over 30 taps. If you only had the time to get to one, Jaf suggested this one due to its wide selection. Benelux (245 Sherbrooke Street West) was identified due to its broad range, accuracy for style and excellent brewing craft. This may seem as a homer pick as one Tico is one of the brewers but after sampling 5 of their beers during my visit I certainly vouch for their quality. l’Amère à Boire (2049 St-Denis) was another spot identified by both. One of the unique aspects of this location is that many of its beers are of the lager variety which is quite rare for micros due to the longer brewing and holding time of beers of this style. Jaf mentioned their Czech Pilsener, Kolsch, and banana flavoured Hefenzweizen among his favorites. Cheval Blanc (809 Rue Ontario Est) was identified as they like to experiment and make very interesting beers. They also noted that their brewer was very approachable and often there. Last but not least, the original Montreal brewpub, Dieu du Ciel (29 Laurier Ouest) was mentioned very fondly. They described it as a brewpub with great character and always have a great mix of basic and experimental beers. Jaf mentioned their Black IPA Chinese tea blend and a Ginger & Mustard Seed Blanche (with very subtle ginger) as some of their recent innovations. As per RateBeer.com, they offer 15 of the best 50 beers in Canada including #1 and #2. MontreAlers is an English local home brewing club that has been in existence for the past 15 or 16 years. Tico has been a member for the past 14 years and this is how he met Benoit Mercier who is the Head Brewer and part owner of Benelux. Jaf has been a member for the past few years and is the current president of the organization. Many of the professional brewers in the area got their start as members of this club. Nathan McNutt is another noteworthy member who is brewer at Reservoir Brewpub and the only National ranked BJCP Member. The Club currently has 55 paid members with and additional 75-100 on their mailing lists. The club meets up once a month at someone’s house to sample beers and have general beer discussions. They generally do blind tests of members’ brews and provide constructive feedback on the brews with the intent to help them correct any flaws. The experience is as serious or as laid back as the individual wants. After sampling some home brews they then normally sample some commercial beer. The group encourages members to push the limits of extreme styles only once the basics of brewing are well understood. A French beer enthusiast club called Biereapholie also exists. This particular group isn’t based on home brewing but are general beer lovers. They have beer tastings and organize importations from other areas with purchases normally being full pallets at a time. The Winter Warmer festival is in its second year and takes place in Montreal and is put on by Brouhaha Brewpub. Tico would like to see them tweak the format. Tickets for this year’s event were $95 + tax. Many find this a steep cost to sample 30 or so heavy alcohol beers although he did mention the festival also offers excellent food. The Mondiale de la Biere is the largest beer festival in Montreal and takes place in June. This year’s event will also serve as the backdrop to the Canadian Brewing Awards and related conferences. This promises to be a road trip worthy event and if possible would be more enjoyable earlier in the festival when the crowds aren’t as large. The Chambly Bieres et Saveurs Festival is near Montreal and is an event that Tico described as “beer lovers meet food lovers”. Several American brewers come up for the event and offers good quality beer, cheese and sausage. It is also a very family friendly event as you can leave your kids in a supervised park for free during the event. This festival takes place Labour Day weekend. Outside of Greater Montreal there are a few festivals that they mentioned as well. Festibiere de Gatineau will take place in May. Festibiere de Sherbrooke will take place in late August. The Oktoberfest des Quebecois takes place in Repentigny in early September. The 2012 Canadian Brewing Awards will take place this June 8th and 9th in Montreal as part of the 19th Annual Mondiale de la Bière. This marks the first time that the event will take place outside of Toronto. TAPS Media is committed to move the event to a new location each year and can officially consider this post the start of lobbying to bring it to Atlantic Canada in 2013! This year will also see the expansion of the Awards Ceremony to include an additional daylong conference featuring speakers, seminars and networking events. Speakers will include brewing pioneers, beer educators and more. Atlantic Canadian Breweries have traditionally been very successful at this event. Fredericton’s Picaroons is the 2011 Brewery of the year with Moncton’s Pump House Brewery having won the Award in 2005. Garrison Brewing Company has also enjoyed success winning the Beer of the Year for their Imperial I.P.A. in both 2007 and 2008. This is an event that is sure to be worth a trip to la Belle Province for any Beer Enthusiast.